For the second time in his career, Ken Roczen has switched brands following a Lucas Oil Pro Motocross title. After two years with RCH Suzuki, whom he joined after winning the 2014 MX title with Red Bull KTM, Roczen has signed with Honda HRC. When Roczen switched to RCH Suzuki, he elected not to race the Monster Energy Cup, pushing his debut to Anaheim 1. This time, he’s going racing in October. Roczen hasn’t had a ton of time on the new bike, and Honda itself is trying to shake out an all-new 450, so this weekend will be a good assessment—and probably serve as a good testing session for A1—for both Honda and Roczen. How will the new pair do? Ryan Dungey returned from a nearly four-month absence last weekend at the inaugural SMX Cup in Germany, and promptly won the overall and helped KTM to the Manufactures’ Cup. Dungey was far from dominant (he failed to win any of the three mains), but was smart and consistent (heard that before?) and it paid off. “It’s been four months since I’ve been on the gate and not that you forget that feeling, but controlling yourself and getting used to that feeling again is good,” he said. The 2016 Monster Energy Supercross Champion will face a stiff challenge from the likes of Roczen, Tomac and more this weekend. He’s also never won the Monster Energy Cup? Is this the weekend he gets it done? Arguably no one has more momentum entering this weekend than Eli Tomac. After a tough Lucas Oil Pro Motocross campaign, Tomac ended the year with two dominating performances at the USGPs at Charlotte and Glen Helen. This will serve as Tomac’s last race weekend of a grueling 2016 schedule that included 31 total races (17 rounds of SX, 12 rounds of MX and two USGPs) and help get off-season testing underway. Can he continue his hot “off-season” on Saturday? Last year at this time, it still wasn’t clear if Chad Reed would even race the MEC, or 2016 for that matter. Reed and Yamaha pieced together a program for the Monster Cup, and then just before Anaheim finalized a deal to revive the factory Yamaha effort for 2016 (and re-signed for 2017). In the past, Reed’s never been particularly motivated for the one-off event, but he told our Eric Johnson earlier this week, that’s changed. “I’ve always just kind of got my head barely above water and, for the most part, was there by obligation only, not because I wanted to be there. The fact that I feel ready and that I really want to go racing, that’s a first time for me at this event. It makes it fun.” After basically taking the summer off (he raced two rounds of MXGP), Reed seems as motivated as ever to win, which even means this weekend. After an injury-riddled 2016 that saw Blake Baggett race just nine rounds of Monster Energy Supercross and five rounds of Lucas Oil Pro Motocross, he begins his new journey this weekend. Following two years with the now defunct Yoshimura Suzuki team, Baggett debuts with Rocky Mountain ATV/MC-KTM-WPS (formerly BTOSports.com-KTM-WPS). He’ll be joined by teammate Benny Bloss, the Missouri native re-signing with the team after a breakout 2016 National campaign that was capped with Rookie of the Year honors. The third member of the team, and 2014 Monster Energy Cup winner, Davi Millsaps, will miss the event after undergoing wrist surgery. How will the new team—and rider—do Saturday? As we pointed on in The List this week, the MEC is a perfect opportunity for 250 riders to move to a bigger bike on a tamer version of supercross. This weekend, Zach Osborne (Rockstar Husqvarna) and Shane McElrath (TLD/Red Bull KTM), both 250 regulars, are moving up. Osborne, who raced a bigger bike well at the SMX Cup last weekend, will race a 450 while McElrath is set to race a 350. This weekend will serve as McElrath’s first race back since his brutal crash at Southwick. Can either make a splash in Vegas? Have you seen this monstrosity? What kind of sick joke is this, Ricky? 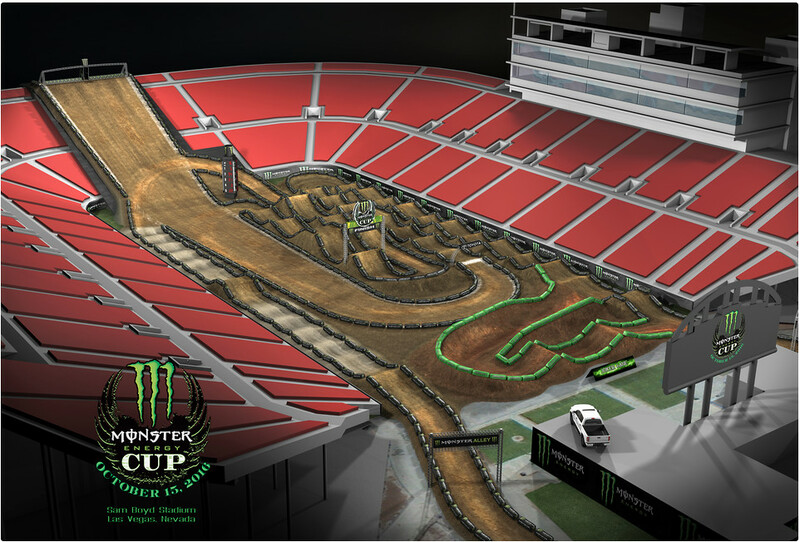 The longest start in supercross history measures 470-feet long with a 33-degree decline and is a staggering 45-feet high. Last year’s race featured a slightly elevated start, but nothing compared to this. It did require some special technique, though, and Jason Anderson was able to dial it in and grabbed three holeshots to win a new Toyota Tundra. Who will figure out this crazy setup on Saturday? As we mentioned earlier this week, the Joker Lane has caused its fair share of problems over the years. Love it or hate it, it provides its own set of intrigue and challenges. Both Ryan Dungey and Ryan Villopoto missed it in 2013 and Jason Anderson joined the club last year. It cost all three a win. This year may be the most challenging yet, as the Joker Lane is directly after a rhythm section, which may throw more than a few riders off. Three of the last four winners of the Amateur All-Stars event have gone on to win Rookie of the Year honors as pros. Aaron Plessinger, winner of the event in 2014, took SX and MX ROY in 2015, joining former Yamalube/Star Racing teammate Cooper Webb, the 2012 winner, as a ROY recipient. Last year’s winner, Austin Forkner, went on to win 2016 MX ROY while a member of Monster Energy/Pro Circuit Kawasaki (2013 winner RJ Hampshire has gone on to success with GEICO Honda). This year will also feature a lot of talent with Garrett Marchbanks (Team Green), Jordan Bailey (Rockstar Husqvarna), Mitchell Falk and Sean Cantrell (TLD KTM), Lorenzo Lucurcio (signed to CycleTrader.com/Rock River Yamaha for 2017), Tallon LaFountaine, Cameron McAdoo (MotoConcepts) and many more. You’ll definitely want to keep an eye on this class. This is the sixth year of the MEC, so you should be familiar with the format, but if you’re not, here’s how it works. There are three qualifying sessions, with the top 18 transferring directly to the three 10-lap main events. The remaining four will be determined through the LCQ. There will be three 10-lap main events. If any rider is able to sweep all three mains, they’ll win $1 million dollars. That’s only happened once, Ryan Villopoto did it at the first MEC back in 2011. If there isn’t a sweep, the overall winner gets $100,000 (not exactly chump change). The Amateur All-Stars and Supermini Classes will have two practice sessions (no LCQ) and run two six-lap main events. The best combined score from each of their two main events gets the victory.